September 2013 - Guardian Safety Solutions International, Inc.
A frightening story recently came out of South Tulsa, Oklahoma. A neighbor in an apartment building accidentally set fire to the entire complex while cooking. A portion of the displaced residents can come back next week after professional crews deal with the fire damage and restore power. Several other groups of residents will not be as lucky in that they have declared their apartments completely destructed. To read the full story make sure you visit the KJRH website. “The number one cause of fires in Springfield is unattended cooking,” said Dennis Leger, aide to Commissioner Joseph Conant in Springfield, MA this week. According to a MassLive.com article, a cooking fire caused some $15,000 in damage to a home when shortly before 3 a.m., a resident dropped frozen French fries into a hot pan of oil on the stove. Moisture in the French fries caused the oil to froth and spill over onto the burner, igniting the blaze. Sadly two women, one aged 65 and one 34, lost their lives recently in the same area because of cooking related fires. In addition to having a fire extinguisher and knowing how to use it, a range top suppression system like ours at GSSI would save lives and property from cooking fires. To learn more, follow us on Facebook at https://www.facebook.com/GuardianSSI. The fire was caused when the resident left the home to pick up their children. They thought they had turned off the stove but it had been on. Thankfully all seems well with the cute cat! The lesson is triple check that you turn off the stove before you leave home! 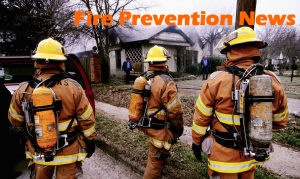 Get Ready for Fire Prevention Week October 6 – 12! WDEL-AM Delaware reports that the Office of the State Fire Marshal said that an apartment building fire that caused dozens to be displaced started in a third-floor kitchen. Officials say cooking materials on the stove top ignited, burning one man severely and causing $1 million in damages. This is one of many fires each year and is why we observe Fire Prevention Week from October 6-12 joining forces with the National Fire Protection Association (NFPA) to teach everyone how to prevent kitchen fires. Guardian SSI will be spreading the word about the dangers of kitchen fires most of which result from unattended cooking. NFPA reports cooking is the leading cause of home fires and home fire-related injuries. Staying in the kitchen when you are cooking. When you cook, wear sleeveless clothing or with tight-fitting sleeves. Keep potholders, oven mitts, wooden utensils, paper and plastic bags, drapes and towels away from your stovetop. Clean food and grease off burners and stovetops. Have a fire extinguisher close by and learn how to use it! More information will be coming as we get closer to Fire Prevention Week.